Asher's birthday was last week and he got some strange presents... which was mostly my fault. Way back in October Asher was obsessed with Halloween decorations. Every time we saw a house that was decorated for Halloween he would start to hyperventilate with excitement. He asked me 1,000 times a day when we were going to get some "scary" decorations for our house. I said we weren't, but he didn't give up. The day after Halloween I happened to be at Target looking for a wedding gift for my sister-in-law and Asher noticed that they had all of their Halloween decorations 50% off. The kid was in heaven (or hell?) 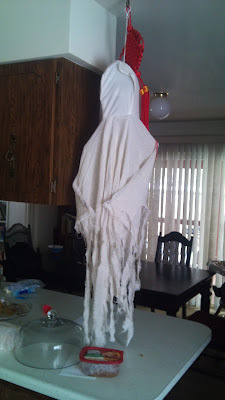 and told me that we should get my sister-in-law Halloween decorations for her wedding. He was insistent and somehow I got sucked in. Who can resist 50% off? That is just pure temptation. So...I bought a movement activated ghost whose face lights up and says "I've been waiting for yooooooou" and a grim reaper that pops up and cackles when you walk past it. When I got home I realized that, even though my sister-in-law has an awesome sense of humor, I didn't really want to give her emblems of death for her wedding. I rationalized that since Asher was so excited about them I would just give them to him for his birthday. It seemed like a good idea in October, but it turns out that having a grim reaper and ghost sitting beside your nativity set and Christmas tree is just weird... really weird. 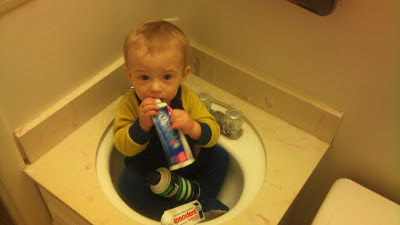 But, at least I was right about one thing, Asher does love them. Jon said that we should just embrace them for a few more days and think of them as the ghost of Christmas past and the ghost of Christmas future... but mostly I can't wait till they go back in the box. I want to put in a plug for a new Christmas book. One of my best friends' mother wrote this sweet book. My friend sent me a copy of it and my kids loved it. The words are sweet and the pictures are beautiful. I am so proud to know the author! 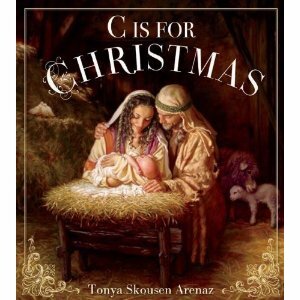 "C is for Christmas" by Tonya Skousen Arenaz is available at Deseret Book and online. If you need a last minute gift or want to add to your Christmas book collection this is a good one! 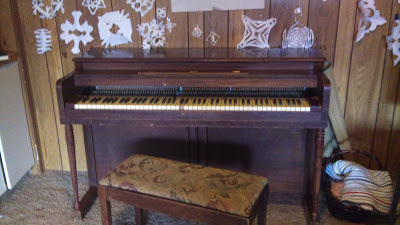 A few weeks ago I found this piano at the DI (thrift store) for $60. It is in rough shape. 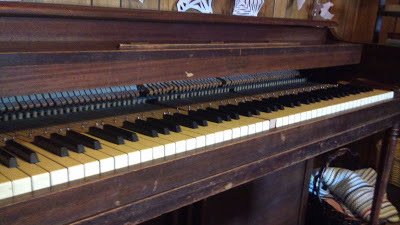 I am pretty sure whoever owned it before must have had some piano abuse issues. 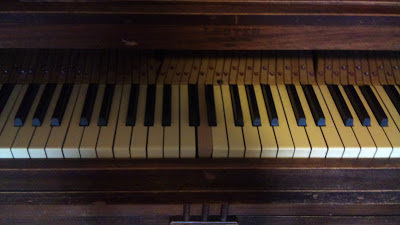 One of the keys (middle "D') is broken, the music stand is missing, the pedals don't work, and the cover you pull over the keys is gone, meaning you can see all the hammers and strings inside. It will take around $200 dollars to get it all tuned up and the pedals fixed, which is still much cheaper than buying a new piano. We figure we are just going for the "stressed antiqued" look... people may lots of money for furniture that looks like this, right? Jon is excited about making it a new music stand and key cover and actually, he spent several nights working on a new "D" key for it. So, while it isn't really very pretty it works. And hey, it is a piano! And it is in tune... mostly! And it was only $60! Abe is walking! He took his first steps about a month ago. Our home teacher was visiting and he was talking about how he taught his nephew to walk while his brother and sister-in-law were away on a trip. They were upset with him because they missed his first steps. Well, Abe must have known what we were talking about because right in the middle of our conversation he pulled himself up on the couch, let go, and started to walk across the room to me. All the adults started to squeal with excitement and he started to laugh... and then fell down. After that he decided that walking was better than crawling and just took off. I don't know what it is about this kid but everything he does seems to be three times cuter than I remember it being with my other kids. I am sure it isn't, but it seems like it. Maybe that is the upside to being a third child (see, Hilary there are perks ;). With Asher's birthday being so close to Christmas we usually get burnt out by all the "stuff" that accumulates in our house this time of year. In years past it has made us really "grinchy" and has killed the spirit of Christmas... present, past, and future. Two years ago, after having an especially frustrating birthday/Christmas season Jon and I decided that we had to do something different or Christmas was not going to be magical at our house... to say the least. We decided to drastically scale back the present giving (only one store bought gift for each person) and to give homemade presents to family, grandparents, and to each other. So far, it has helped. Last year I thought that the idea of homemade gifts would be "keeping it simple" but quickly found out that doing homemade gifts is ten times more consuming than buying something from the store. Even so, last year we really enjoyed it because we felt it changed our focus from "what we would get" to what "we could create for someone else". 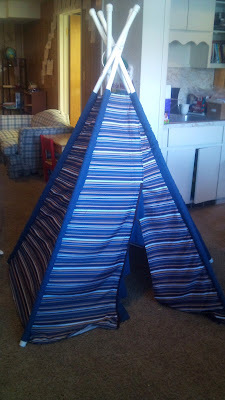 A tepee! Made out of PVC pipe and bed sheets. What traditions do you have that keep Christmas focused on Christ and keep you from getting "grinchy"? Congratulations on your piano!! That is soooo exciting!! Maybe someone in your ward or stake can help you restore it. We have a friend who does that, just as a hobby. Anyway, what a steal! Hooray for the piano! We got a used one that needs a little help with our Christmas money this year. Love it!